The Miracle of Mercy Land is a very intriguing, mysterious novel written by River Jordan. The story is set in southern Alabama during the 1930s. 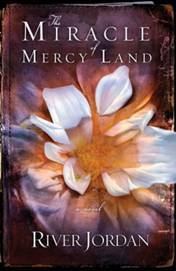 Mercy Land is a young woman who has left her life on the riverbanks to settle in the big city. She has made herself an indispensable right hand to Doc Philips, the publisher and editors of the city's newspaper. The mystery begins as a strange book appears on Doc's desk on morning. It contains words and maps of the lives of everyone in Bay City including decisions they have made in the past and how they steer the future. It's memorizing light seems to draw Doc and Mercy in for hours as they scan pages and people. Seeking deeper meaning and hoping to fix the past, Doc Philips brings a young man named John Quincy into town. It's here that the mystery takes such a strong turn, it was hard to put the book down! The author masterfully weaves each of the characters into the narration where they share personal thoughts and views of the mysterious book: Mercy is protective of the book and does not want it to be used for the wrong purposes as she searches for its meaning. Doc Phillips hopes that the book will right the things of his past that haunt him and ease his guilty conscience. John Quincy wants to use the book to visit his horrible past, change certain events and to change the path of his life. The author, River Jordan is a gifted descriptive writer who is able to bring her characters to life. This book was quite intriguing and mysterious. At times, I was not exactly riveted into the story, yet the unique twists of the mystery left me unable to put it down. It's a very unique read! The Miracle of Mercy Land was provided to me free of charge for review by Kelly Blewett of KBK Public Relations. Would you like to read this book? Leave me a comment! I'll randomly choose a name Sunday night at midnight! Ooooh! This book sounds so intriguing!! I wanna win!!! Thank you for reading and featuring The Miracle of Mercy Land on your blog. It's wonderful to meet new readers!